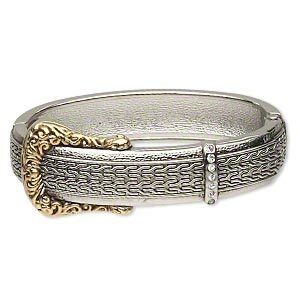 Bracelet, bangle, antiqued nickel-finished steel, 36mm wide with diamond design, 2-1/2 inch inside diameter. Sold individually. 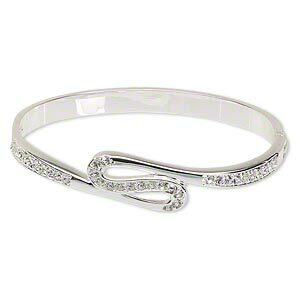 Bracelet, hinged bangle, glass rhinestone / gunmetal- / antique silver-finished steel / "pewter" (zinc-based alloy), clear, 36mm wide with curved teardrop design, 6 inches. Sold individually. 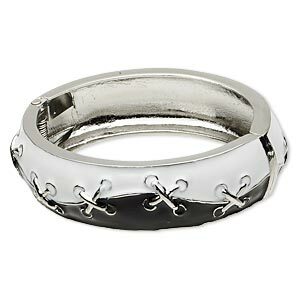 Bracelet, bangle, silver-finished steel, 12mm wide with (40) interlocking textured bands, 8 inches. Sold individually. 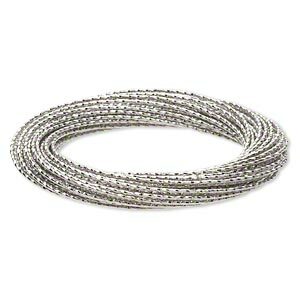 Bracelet, glass / steel memory wire / silver-finished steel, clear and white, 40mm wide coil, 7 inches. Sold individually. 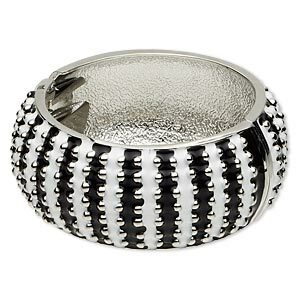 Bracelet, hinged bangle, epoxy and rhodium-finished "pewter" (zinc-based alloy), black and white, 32mm wide with raised dot design, 7 inches. Sold individually. 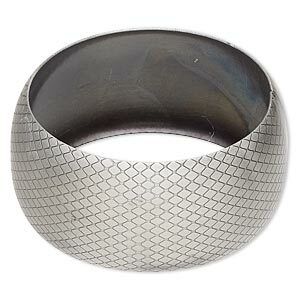 Bracelet, hinged bangle, epoxy and rhodium-finished "pewter" (zinc-based alloy), black and white, 20mm wide with raised crisscross design, 6 inches. Sold individually. 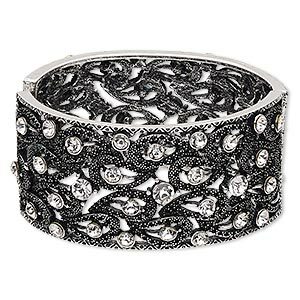 Bracelet, hinged bangle, Czech glass rhinestone / silver-finished / gold-plated "pewter" (zinc-based alloy), clear, 25mm wide with belt design, 6 inches. Sold individually. 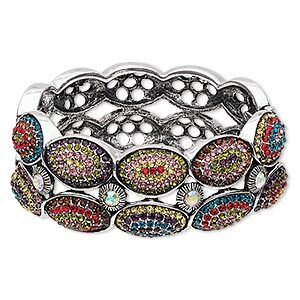 Bracelet, hinged bangle, glass rhinestone / antique silver-finished steel / "pewter" (zinc-based alloy), multicolored, 27.5mm wide with 2-row oval design, 6 inches. Sold individually. 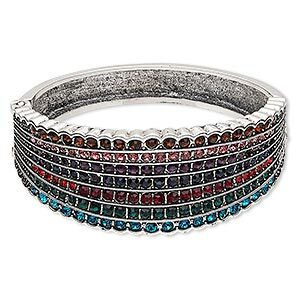 Bracelet, hinged bangle, glass rhinestone / antique silver-finished steel / "pewter" (zinc-based alloy), multicolored, 28mm wide with 7-row channel set, 6 inches. Sold individually. 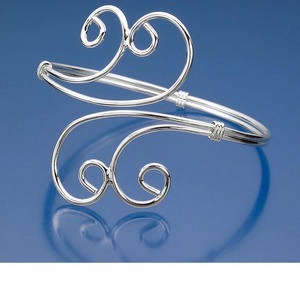 Bracelet, bangle, silver-plated iron, 54mm wide with swirl, 7-1/2 inches. Sold individually. 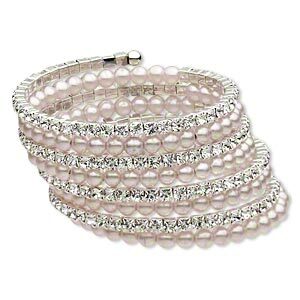 Bracelet, hinged bangle, glass rhinestone and silver-plated brass, clear, 12mm wide with S-shape, 6-1/2 inches. Sold individually.